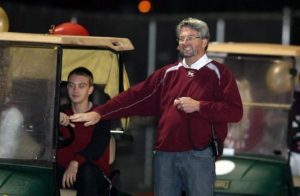 The opening of a physical education position as well as the need for assistant coaches in both cross country and track and field prompted South Kitsap athletic director Ed Santos to resign from his administration position. Santos also cited a change in his family’s situation, his youngest son is a recent South Kitsap graduate and will head to Whitworth University in Spokane in the fall to run cross country, also fueled his desire for a change. It was something Santos had been considering for the last couple of years, citing the hectic schedule of an AD. Santos is no stranger to coaching. Before spending 11 years as AD at South, he coached cross country at South for 18 years. He was inducted into the Washington State Cross Country Coaches Association Hall of Fame in 2007. Santos has been in the school district for 33 years and began teaching physical education at the elementary level, for 14 years, then high school for eight before becoming AD. Santos doesn’t think too much has changed in teaching students to stay active. North Kitsap pitcher Kole Milyard and Central Kitsap pitcher Griffin McCormick were each named to their respective Washington State Baseball Coaches Association All-State teams on Monday. Milyard was the Sun’s baseball player of the year and finished with a 6-1 record with 45 strikeouts while allowing only three earned runs in nine games. He was named to the Class 2A first team while McCormick was named to the 3A first team. McCormick was the Narrows League 3A MVP and won seven games and struck out 54 while posting a 1.47 earned run average. Making the 2A second team were Bremerton’s Anthony Amicangelo and Zane Zurbrugg and Olympic’s Matt Walters. The All-State teams are selected by WSBCA board and member coaches. GK—Travis Peyton, sr., Gig Harbor; Sean Carlin, jr., Bellarmine; Forward—Ryan Clark, sr., Bellarmine; Robert Nurmi, sr., Bellarmine; Midfield—Issac Russell, sr., Bellarmine; Bryson Gardener, jr., Bellarmine; Kolby Johnson, sr., Olympia; Collin Tate, sr., Timberline; Conner Tovey, sr., Gig Harbor; Elijah Wolfe, sr., Bellarmine; Defenders—Tommy Martin, jr., Bellarmine; Garett Landers, so., Olympia; Tyler Vu, jr., Bellarmine; Sean Lane, jr., Bellarmine; Kendall Burke, so., Stadium; Madison Douglas, jr., Timberline. GK—Dylan Zurfluh, sr., Bellarmine; Matteo Delgiudice, jr., Olympia; Forward—Max Hilger, jr., Bellarmine; Shawn Kimble, jr., Gig Harbor; Erik Silva, sr., Stadium; Midfield—Nate Faber, sr., Yelm; Ryan Sanchez, jr., Bellarmine; Gavin Stewart, so., Yelm; Paul Wadsworth, jr., Stadium; Eduardo de la Cruz, fr., South Kitsap; Defenders—Max Nail, sr., South Kitsap; Alika Pai, sr., Gig Harbor; Ryan Stewart, sr., Bellarmine; Mitchell Nee, so., Olympia; Matt Lamfers, jr., Timberline. GK—Diego Rodriguez, jr., North Thurston; Alek Greenleaf, jr., Wilson; Forward—Jose Aguilar, sr., North Thurston; Angel Herrera, so., Lincoln; Midfield—Vitthal Powell, sr., North Thurston; Pablo Ramos, jr., Wilson; Logan Beachy, sr., Central Kitsap; Scott Penner, jr., Capital; Defenders—Ian Maclean, sr., North Thurston; Daniel Ocampo, sr., Lincoln; Jack Coupe, sr., Central Kitsap; Alan Ryan, sr., Capital. GK—Simon Capilla, sr., Lincoln; Forward—Tommy Johnson, sr., North Thurston; Jesus Flores, jr., Shelton; Anei Yel, jr., Wilson; Midfield—Charles Jellison, jr., North Thurston; Ronaldo Venegas, sr., Lincoln; Kevin White, sr., Central Kitsap; Willie Klemmer, jr., Capital; Defenders—Skyler Stephens, jr., Central Kitsap; Carter Stephens, jr., Central Kitsap; Rodolfo Castillo, sr., Capital; Michael Benitez, so., Wilson. Central Kitsap’s standout pitcher Hope Lawrence was named the Narrows League 3A most valuable player while the Cougars had three players named to the first team. CK softball coach Courtney Lacock was named the coach of the year. 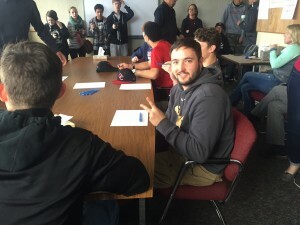 Lawrence will play at Shoreline Community College next season. First baseman Elise Freund, who is headed to Pacific Lutheran University, senior Chance Barg and junior Madi Anderson were the first-team selections. In Narrows 4A, South Kitsap third baseman Diavionne DeWalt was named to the first-team along with pitcher Ali Paulino. MVP — Jordan Adams, Gig Harbor, jr.
First team — Pitchers: Drea Schwaier, Yelm, so. ; Brooklyn Taylor-Sparks, Timberline, jr. Catcher: Taylor Gubser, Yelm, fr. Middle inf. : Nicki Dehan, Yelm, sr.; Tessa Waage, Gig Harbor, sr.; Alyssa McKiernan, Bellarmine Prep, sr. Corner inf. : Abbie Hutton, GH, sr.; Diavionne DeWalt, South Kitsap, so. OF: Erin Roloff, Olympia, sr.; Ally Choate, Yelm, jr., Meg Sullivan, Bellarmine Prep, jr. Util. : Alexandra Kessler-Paulino, South Kitsap, jr.
Second team — Pitchers: Tayelyn Cutler, Yelm, fr. ; Chelsea Smith, Bellarmine Prep, so. ; Catcher: McKenzie Schwan, Bellarmine Prep, jr. Middle inf. : Mackinzee Moore, Yelm, fr. ; Sophia Canton, South Kitsap, jr. Corner inf. : Haley McMasters, Bellarmine Prep, fr. ; Alix Peffly, Timberline, fr. ; Carley Nelson, Yelm, jr. OF: Emery Norwood, Stadium, jr.; Brooke Fesenbek, Olympia, so. ; Makenzie Sylvester, Timberline, sr. Util. : Erica Grenlund, Bellarmine Prep, sr. Honorable mention — Catchers: Bailey Werner, Gig Harbor, so. ; Bailey Haddock, Timberline, fr. Middle inf. : Lauren Forseth, Gig Harbor, so. ; Isabel Chapman, Stadium, sr. Corner inf. : Jaeden Els, Yelm, so. ; Hailey Lasmanis, Olympia, jr. OF: Tess Parker, Gig Harbor, sr.; Angel Prewitt, South Kitsap, jr.; Alexis Gojovich, South Kitsap, so. ; Maddie Potter, Gig Harbor, jr. Util. : Patricia Hultman, Stadium, sr.
MVP — Hope Lawrence, Central Kitsap, sr.
First team — Pitcher: Natalie Albaugh, Shelton, fr. Catcher: Corey Lindsay, Shelton, sr. Middle inf. : Aaliyah Kautz, North Thurston, sr.; Marissa Adams, Central Kitsap, jr.; Loretta LaClair, Shelton, sr. Corner inf. : Ciarra Davis, North Thurston, sr.; Elise Freund, Central Kitsap, sr.; Kiana Turner, Wilson, jr. OF: Aurora Gouley, Shelton, sr.; Chance Barg, Central Kitsap, sr.; Madi Anderson, Central Kitsap, jr. Util. : Peyton Uznanski, Capital, so. Second team — Pitcher: Maddy Lincoln, Capital, sr. Catcher: Zee Young, Central Kitsap, so. ; Raynie Ehret, North Thurston, jr.; Middle inf. : Kathy Le, Foss, so. ; Judy Soliai, Lincoln, so. ; Corner inf. : Tera Geimer, North Thurston, so. ; Matlyne Mecham, Shelton, jr. OF: Haley Julkenen, North Thurston, jr.; Sam Wallace, Central Kitsap, jr.; Alexis Groshong, Wilson, so. ; Util. : Brittney Kincy, Capital, so. ; Blanca Vielma, Foss, jr. Honorable mention — Pitchers: Kately Kass, Wilson, jr.; Isabel Pfingston, Mt. Tahoma, fr. Catchers: Hallie Bader, Foss, sr.; Taytum Pesek, Wilson, so. Middle inf. : Keiamae Sagapolu, Lincoln, so. ; Delaney Kennedy, Capital, fr. ; Alyssa Jordenson, Shelton, so. ; Alann Bates-Carector, Mt. Tahoma, sr. OF: Rachel Wofford, Capital, sr.; Kylee Freese, North Thurston, fr. ; Masie Vollendorff, North Thurston, so. ; Hallee Garrick, Shelton, jr.; Util. : Victoria Nuon, Lincoln, jr.; Cassidy Garchow, Central Kitsap, jr.
South Kitsap senior Eric Wattree won’t be playing basketball at Eastern Washington after all. Wattree, who committed to play for the Eagles in January, will play at the University of Hawaii-Hilo next season. He signed with the NCAA Division II program Tuesday. How did Eastern Washington fall out of the picture? Well, Wattree was ready to sign his national letter of intent in February, but described having a falling out with Eastern coach Jim Hayford. Wattree didn’t want to go into details, but mentioned “having to stand up for myself and my family.” Wattree also said there were financial considerations that made decommitting from Eastern necessary. Wattree received a full-scholarship offer from Hawaii-Hilo, which finished 9-15 last season. Wattree will be reunited with former South Kitsap teammate Ryley Callaghan, who is headed to Hawaii-Hilo after playing two seasons at Peninsula College. Wattree was a sophomore and Callaghan a senior when South Kitsap made it to the Class 4A state tournament in 2014. The Wolves finished 18-8 that season. “I’ve always looked up to Ryley,” Wattree said. Even though signing day didn’t turn out to be one of the highlights of his high school career, Wattree feels he’s in a great situation moving forward. Alex Scott signed his letter of intent to play lacrosse at Adams State University in Alamosa, Colorado, on Wednesday. During Wednesday’s signing ceremony at South Kitsap High, senior Alex Scott signed to play Division II lacrosse for Adams State University in Alamosa, Colorado. Scott, who plays the attack position for the Wolves, has 15 goals and eight assists in five games. SK coach Julius Ifurung said Scott is the first player from the program to sign a letter of intent to play college lacrosse.